In some regions of the ocean the horizontal divergences within the Ekman layer, driven by the local wind field, are large enough to drive significant upwelling of deeper, cooler waters to the surface. These waters are nutrient-rich and support big fisheries. 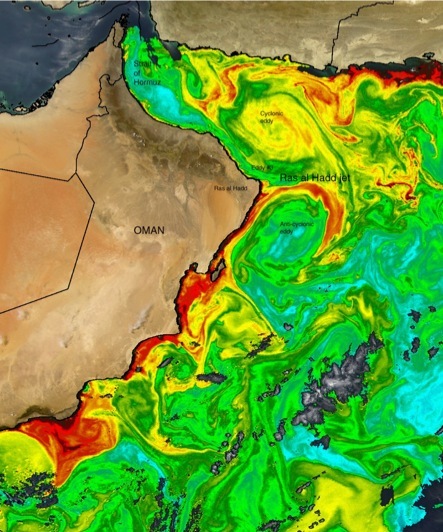 This image shows coastal upwelling off Oman in the Arabian Sea (Northeastern Indian Ocean). The upwelled waters are traced by their high Chlorophyll-A concentrations - i.e. by strong blooms of phytoplankton. Upwelling here is seasonal, driven by southwest monsoon winds during the summer months. The upwelled waters trace the complexity of the coastal flows: headlands cause filaments and jets of water to be expelled from the coastal region. Stirring of the coastal waters with waters farther offshore is evident. Two eddies either side of Ras al Hadd are evident, as is the inflow of low-Chlorophyll Persian Gulf waters. Why is equatorial upswelling an order of magnitude bigger than coastal upwelling? Discuss what drive Equatorial Undercurrent in the Pacific? Sugges other places in the ocean where upwelling might be important (other than the coast, equator, and Southern ocean) - i.e. where else are isopycnals steeply sloped?